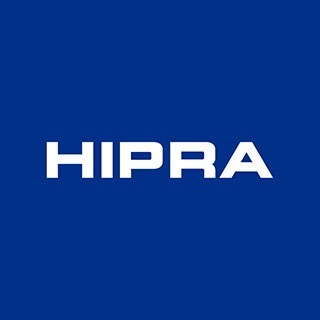 1HIPRA. 2Dalland Hybrid España S.A. 3Department of Comparative and Pathological Anatomy, Veterinary Faculty, University of Murcia. Atrophic Rhinitis (AR) is an infectious bacterial disease that is very important in swine production because of its high global prevalence, its capacity for persistence and transmission and because of production losses and associated treatment costs. Regressive AR (RAR) or non-progressive AR (NPAR) is the mild or moderate form of the disease, the agent responsible being Bordetella bronchiseptica (Bb). During lactation and/or the nursery phase, piglets exhibit the clinical signs and macroscopic lesions that are characteristic of this form of the disease. The bacterium may also be involved in the severe form of the disease, progressive AR (PAR), causing infection concurrently with toxigenic strains of Pasteurella multocida (PM), and acting as a predisposing factor for other diseases. In recent years, the main strategy for the prevention of AR has been the prophylactic use of antibiotics. However, this practice is now being challenged because of the risk of development of resistance to widely used antimicrobials. Accordingly, the countries of the European Union have put into effect new legislation to reduce the use of antimicrobials in swine production and the production of other domestic species, aimed at more prudent use of these. As a consequence of this approach, prevention of the disease by means of different strategies that include segregation by age, biosecurity and vaccination have emerged as suitable alternatives for keeping AR under control, without loss of productivity as a result of adjusting production systems to the new legislative requirements. The vaccine RHINISENG® (HIPRA) is the only vaccine registered on the European market for the indication control of NPAR and PAR (EMA/602473/2010). The objective of this study was to demonstrate the efficacy of RHINISENG® against Bb in piglets on a commercial farm with suspected NPAR during the nursery phase. For this, seroconversion in sows and piglets was compared, as were turbinate lesions and the productive parameters of the piglets in the vaccinated group of sows compared to the non-vaccinated group. The study was carried out on a twophase commercial farm (farrowing and nursery) with approximately 550 sows and 2,400 piglets in the nursery phase. With regard to its health status, the farm was free of PRRS and the principal respiratory diseases were controlled (swine influenza, Aujeszky’s disease, swine pleuropneumonia and enzootic pneumonia). The farm was selected on the basis of its history of clinical signs consistent with NPAR in piglets during the first stages of lactation or in the nursery phase (from 1 day to 8 weeks of life). The symptoms that were observed were coughs and sneezing, together with an increase in the number of animals with retarded growth. By taking samples from piglets and sows, it was confirmed by serology and PCR that the herd was positive for Bb and negative for PM. The information available allowed confirmation that there was a clinical problem of NPAR on the farm. Vaccinated group (VG): 4 sows were selected and vaccinated with the commercial vaccine RHINISENG® (HIPRA) 6 and 3 weeks before farrowing in accordance with the vaccination schedule described by the manufacturer. Non-vaccinated group (control group, CG): 4 sows were selected and inoculated with 2 ml PBS as placebo 6 and 3 weeks before farrowing. Prevalence of Bb The presence of Bb was evaluated by PCR in nasal secretions from 4-5 piglets per litter at 1, 7, 21, 46 and 67 days post-partum (dpp). Presence of antibodies against Bb and PM in sows and piglets The presence of antibodies during selection and the serological response to Bb and PM following vaccination were evaluated by means of the microagglutination test (MAT) and ELISA, respectively. Evaluation of clinical symptoms and turbinate lesions Clinical respiratory symptoms were evaluated daily during lactation and nursery. At 6.5 weeks of life, lesions in the turbinates of 10 randomly sacrificed piglets from each group were examined macroscopically and samples taken from these in 10% formalin for subsequent histopathological study. Evaluation of the productive parameters of the piglets The weights of the litters and the Average Daily Weight Gain (ADWG) of the two groups of piglets were compared on the day of farrowing and at 21, 46 and 67 dpp. The control of AR by vaccination is based on the immunization of pregnant sows, thereby preventing the development of the disease in their progeny following the ingestion of colostrum. This study demonstrates the effects of the RHINISENG® vaccine on a commercial farm with clinical problems caused by Bb in the farrowing and nursery phases. The results showed the progressive colonization of the piglets’ nostrils by the bacterium in both groups (Figure 1), the highest percentage of positive piglets being reached 46 dpp (52.38% and 100% of positive animals in the VG and CG respectively). The percentatge of positive piglets in the VG detected by PCR was significantly lower at 21 and 46 dpp than that in the CG (Figure 1). These results agree with those previously published that report that vaccination does not eliminate colonization of the respiratory tract by Bb. However, in this study a decrease was observed in the percentage of infected animals in the litters of vaccinated sows and, consequently, a decrease in the excretion of the bacterium. As the vaccine has valencies against the two principal agents of AR (Bb and PM), both serological responses were evaluated. At the start of the study, all the sows were seropositive against Bb (average titre of 1/96), probably associated with the circulation of the bacterium on the farm. After vaccination, an increase was observed in the antibody titres in both groups, that was maintained until the day of farrowing (Figure 2A). It should be pointed out that this increase was significantly higher in the VG than in the CG. The antibody levels in the VG were between 5 and 11 times higher than those in the CG, of particular note being that on the day of farrowing they were 7 times higher. Similarly, the colostrum from the vaccinated sows had a titre against Bb that was 7 times higher than that of the colostrum of sows in the CG. 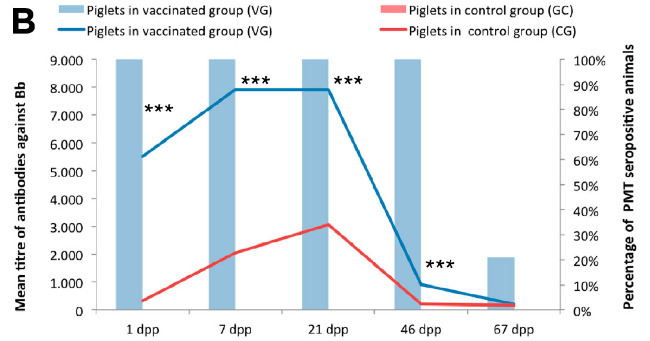 Also, the piglets in both groups were seropositive at one day of age, although the piglets of vaccinated sows had an antibody titre that was 17 times higher than that of the piglets of unvaccinated sows (Figure 2B). The differences in antibody titres between the piglets in the two groups (VG vs CG) were significant up to 46 dpp. These results show that the higher the level of serum immunoglobulins in the sow, the greater the quantity of immunoglobulins in the colostrum and, consequently, in the serum of the piglets. In contrast to Bb, at the start of the study none of the sows had antibodies against PM, and the sows in the CG did not seroconvert at any time during the study. Seroconversion was only observed in the VG after vaccination, with 100% of the animals seropositive 27 dpv until the end of the study (5 dpp). Similarly, all the colostrum from the day of farrowing and the serum from the piglets in the VG were positive against PM up to 46 dpp. As regards clinical efficacy, no clinical signs or changes in general condition consistent with AR were observed in the piglets of either group. The absence of obvious clinical signs is the usual form of presentation of the chronic form of the disease in animals with passive immunity. However, the animals did show macroscopic and microscopic changes in the nasal turbinates, so that clinical efficacy could be assessed by comparing these changes in the two groups. The analysis of the turbinate lesions was carried out at 6.5 weeks of life, which coincides with the time when the greatest prevalence of lesions in the nasal turbinates caused by Bb has been documented. A smaller percentage of affected piglets was observed in the VG than in the CG. These lesions were also less severe in the VG (p<0.1). Similarly, the histopathological analysis of the bone alterations showed that the CG was more severely affected, both in terms of the number of piglets with lesions and the lesion score (Table 1). Finally, the presence of Bb in the nasal cavity of all the animals that were analyzed, except 1, indicates that this was the agent associated with the lesions that were observed. Table 1. Macroscopic and microscopic lesions in the nasal turbinates and nasal septum of piglets of vaccinated sows (VG) and in piglets of unvaccinated sows (CG) at 6.5 weeks of age. Finally, the evaluation of productive parameters (average weight of the piglet and ADWG) showed better results in the VG than in the CG (Table 2). These results confirm that infection with Bb on a commercial farm causes changes in the productive parameters of the animals, in line with the results published previously, who observed a decrease in ADWG in animals infected experimentally with Bb. Table 2. 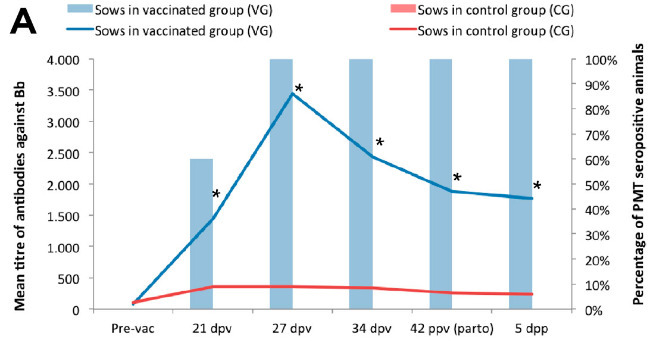 Average piglet weight (kg) and ADWG (g) 1n piglets of vaccinated sows (VG), and in piglets of unvaccinated sows (CG) at different times in the study. In this study, the efficacy of the RHINISENG® vaccine was demonstrated for the control of problems with Bb on a commercial farm during the nursery phase, by means of laboratory, clinical and productive evaluations in the piglets. The combined results in favour of the VG indicate that vaccination of the sows conferred protection on their offspring against Bb by means of passive protection in the colostrum. The levels of antibodies transferred to the VG piglets were sufficient to protect them against the disease. These had a lower prevalence of the bacterium in their nostrils, a reduction in the appearance of lesions characteristic of NPAR at 6.5 weeks of age and better productive behaviour at the end of the nursery phase (average piglet weight and ADWG) than the CG piglets. 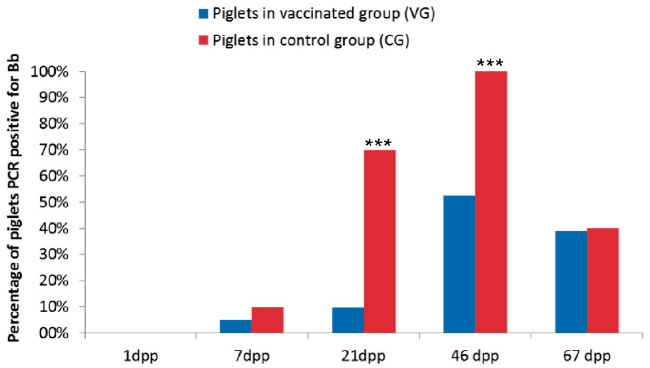 Therefore, the key role played by vaccination of pregnant sows in the protection of piglets against NPAR is confirmed in this study, offering an effective alternative to the prophylactic use of antibiotics. The authors would like to thank HIPRA technical services (Ramón Jordà) for their valuable support and the staff of UCAM [Scientific Marketing Support Unit] (HIPRA) for their technical assistance (DIAGNOS and M. Blanch).